Dynamic roles are a way to write custom authorization logic (as opposed to authentication logic). The "Dynamic Roles" feature works similarly to the Authentication Classes feature, but while authentication classes are assigned to a backend and are for general authentication, the dynamic roles are assigned to classes (MetaModels) and enable custom role checks. These custom role checks can be used instead of default role checks (simple roles "Guest", "User", "Owner" etc.) and ACLs. ACL role objects can still be assigned, but you have to check their contents yourself. The name for the above mentioned candidate classes is "role class", borrowing from "auth classes". In the context of dynamic roles, "role class" doesn't mean the Basics. Role class or a subclass of it. It's the equivalent of the term "auth class", which describes classes whose hook classes contain a custom auth method. Here, a "role class" is a class whose hook class contains a custom role check method. You can create your own "role classes", meaning you can implement your own isUserInRole() method in the related hook class. 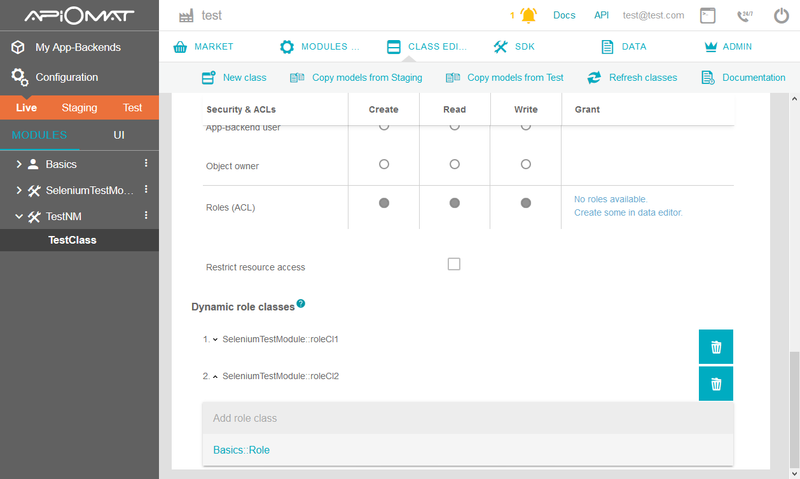 In order to do so, create and download a native module (see Create your own for information on Native Module development) with the classes you intend to utilize for authorization. Afterwards, import the downloaded project into your IDE. You will notice that every class you added to your module is now extended by two Hook-classes named <yourClassName>HooksTransient and <yourClassName>HooksNonTransient. The parameters should contain all information you need to decide whether the user is allowed to access the resource or not. "Accessing the resource" means the user is doing a CRUD operation on an object. getModuleName(): Returns the module's name. Can be null if the role check is for an image or file that hasn't been attached to an object. getModelName(): Returns the class name. Can be null if the role check is for an image or file that hasn't been attached to an object. getModelObject(): Returns the object the user wants access to. Can be null when the role check is for an image or file. getStaticData(): Returns the image or file the user wants access to. Can be null if the role check is for an object. getAllowedRoles(): Returns a set of role names of the roles that are assigned for the given operation. For example, when you create a role object with the name "foo" and add it to the allowed roles for the WRITE operation for a class, then when your isUserInRoles() method gets called when a user makes an HTTP PUT request, getAllowedRoles() will return a set with one String element "foo". After implementing this method you can upload the respective Native Module again. ApiOmat will then automatically switch the ownRoleCheck flag to true on the class whose hook class contains the implementation. You should always handle ALL operations, because as soon as a role class is assigned to protect another class, the custom role check method is called for ALL operations. So if you only handle READ with some checking logic and otherwise return false by default, all operations other than READ will always fail. The response body is a JSON array of JSON objects, with the JSON objects representing MetaModel objects. You can assign multiple role classes to one class and set the order in which the custom role check methods should be called. Now, when a CRUD request is sent to an object of your class X, first the A.isUserInRoles() is called. If it returns true, the authorization is successful. If it returns false, B.isUserInRoles() is called. If this returns true, the authorization is successful. If it returns false, the authorization fails. Simply choose the dynamic role classes you'd like to apply to your class from the dropdown-selection. Afterwards you can order them by using the arrows left of the classes' names. When sending an HTTP PUT request to a MetaModel, you should include ALL attributes of that MetaModel with their old values, because all attributes that aren't included in the PUT request will be set to their default values. This is similar to sending a PUT request to an object of a class with the HTTP header "x-apiomat-fullupdate: true" and omitting some attributes - the values of those omitted attributes will be set to their defaults as well. As soon as you assign a role class to a class, the authorization for ALL operations (CREATE, READ, WRITE, GRANT) will be set to "AppAdmin" and the custom role check method(s) will be called for ALL operations. This is why you should always handle ALL operations in the isUserInRole() method. If you only handle READ with some checking logic and otherwise return false by default, all operations other than READ will always fail. Let's say you create a Module M with a class A and B. Your users' credentials are stored in a 3rd party system X and the user roles are stored in a 3rd party system Y.
return isUserAllowedToCreateObjectInExternalSystemY(request.getUserEmail(), roleData.getModelName()); // Makes SOAP call into 3rd party legacy system Y to check if the user is allowed to create an object of class "roleData.getModelName()"
auth() is called, which sends her credentials to X (3rd party credential storage). Her credentials are valid, which means she is authenticated. Now isUserInRoles() is called, leading to checking in Y (3rd party role system) if she is allowed to create an object of type "A". She is allowed, so the object is created. Her credentials are valid, which means she is authenticated. Now isUserInRoles() is called, where in the switch-case WRITE leads to "false" being returned. An authorization error response is sent. Her credentials are valid, which means she is authenticated. Nothing else is checked, because the role class C is not assigned to protect B. Not even the default roles are checked (which would be "GUEST" for the CREATE operation)! You can manually call AOM.checkRoles() from within the auth() method. In case the class of the object is protected by role classes, this also leads to the custom role check method to be called! In case you pass your own "memberId" values to checkRoles(), the custom role check method must read this value from the DynamicRoleWrapper parameter, instead of using request.getUserEmail(). auth() is called, which sends his credentials to X (3rd party credential storage). His credentials are valid, which means he is authenticated. Now isUserInRoles() is called, leading to checking in Y (3rd party role system) if he is allowed to create an object of type "A". He is not allowed. An authorization error response is sent. Her credentials are not valid. An authentication error response is sent. isUserInRoles() is never called. This is only ONE example. Contact the support if you need assistance with setting up auth and role classes for specific requirements. The role classes map is a string array containing entries with the following format: <orderNumber>=<moduleName>$<className> . The order number defines the dynamic role check order and the combination of moduleName and className defines the class that implements the custom isUserInRoles check. For more detailled information about the other @Model annotation parameters visit Development Basics. In contrary to auth classes, where you can reject app admins, you can't reject app admins with role classes. So for example when you set M$A as role class to protect your class X, and an app admin sends an HTTP GET request to X to fetch all objects of that class, then even if A.isUserInRoles() returns false, the app admin gets a valid response. So to reject app admin requests, use auth classes. When a user requests a list of objects, and the class of the object has a role class configured to be used as protection, the custom role check is executed on each object by default. If the list contains 1000 objects, and your custom role check method contains complex logic or even contacts a third party system for role information, this might turn into a performance bottleneck. To avoid this, ApiOmat provides you with a mechanism to preconditionally skip following custom role check calls within getAll and deleteAll operations. You can set Java Predicates within the DynamicRoleWrapper to inform ApiOmat if the next class objects of the same request need a custom role check or not. In other words, the predicates contain logic to determine if a custom role check call is necessary or not. To improve or refresh your knowledge about Java predicates you can read the official reference documentation at: https://docs.oracle.com/javase/8/docs/api/java/util/function/Predicate.html or read other tutorials like https://howtodoinjava.com/java-8/how-to-use-predicate-in-java-8/ . You've implemented a custom role check that returns true if an object contains a specifc role and the request user is member of this role. Now, a user calls getAllObjects e.g. via REST. final String neededRole = "UserRoleThirdParty"
First, check if the request user is authorized against any third-party system of your choice (see hasUserRole in example). After that construct your predicate that defines a role check skip condition, e.g. if the object contains a specific role (see neededRole in example). This predicate then needs to be set to the DynamicRoleWrapper. Setting the predicate to the SkipCustomRoleCheckWithTruePredicates means whenever one of the next objects of the GetAll-Request matches the given predicate, the role check will return TRUE for this request user. So your custom role check is only called once for all the objects in the list that match the same conditions. Additionally you are able to skip custom role checks and reject the request by returning false. Imagine a user wants to delete all objects of a class but the list contains an important object that should not be deleted. Simply define a predicate and add it to the SkipCustomRoleCheckWithFalsePredicates of the DynamicRoleWrapper and the next object that matches the predicate will return a failed authorization check without calling your custom role method again.